The OS Explorer series works at 1:25000 which is 4cm to the kilometer or 2.5 inch to the mile. That's as tight a scale as you'll get from the OS (their Landranger series are less fine at 2cm to the kilometer) and it's easily enough for casual rambling or more serious hiking. 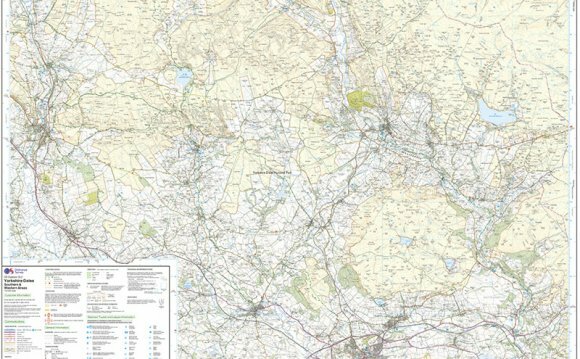 To give you an idea of the scale, it takes four of these Explorer maps to cover the English Lake District (OL4, 5, 6 and 7 - for my holiday there this year I'll be taking three maps) or two (OL26 and 27) for the N York Moors. I would suggest that if you're driving or cycling on good roads and paths you may be better off with the more manageable Landrangers. These maps are printed both sides, and they also fold out pretty big, so if your route takes you over the page, maneouvring these beasts can be a little cumbersome. Note also that the key is only printed on one side, across a boundary and that can cause some difficulties. So, some serious map folding is needed - when I was in the Territorial Army, we even had a lesson on the subject. You could do well to buy a map case to keep it dry. Alternatively, you can buy a waterproofed edition of the map - the "Active" version - which costs a few pounds more but is even bulkier. If you're sticking to roads, paths or decent tracks, or are going to be within sight of plenty of obvious landmarks, you can operate without a compass. If your walk is a little more adventurous, you'd be wise to carry one with you, but bear in mind that effective compass usage doesn't come without a little training and practise. Final tip: before you leave the car park, "orient the map". In other words, make sure you know where you are on the map and where you're going.